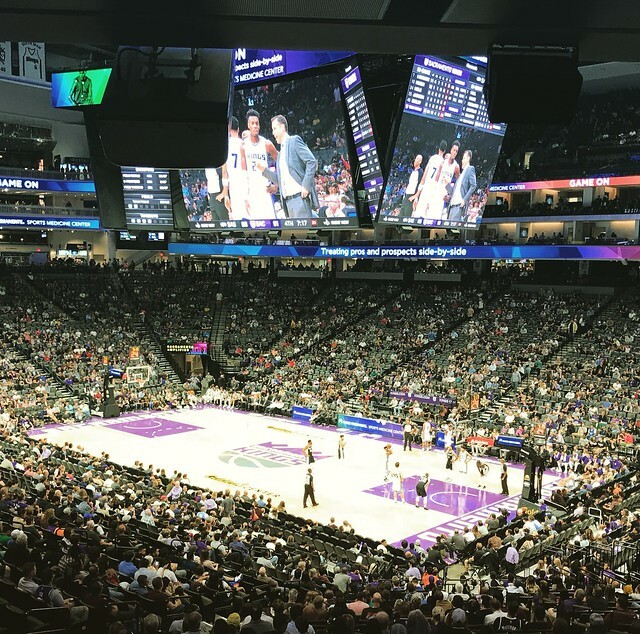 Larkin and I went to the Sacramento Kings versus San Antonio Spurs preseason NBA game at Golden One Center. Holding on to a small lead for most of the game, the Kings won the game by the score of 106 to 100. Frank Mason was the Kings leading scorer. Mason played four years at Kansas and was drafted 34th overall in the second round of the 2017 draft. Playing 22 minutes, he had 17 points on 5 for 10 from the field, 2 for 4 from three point range and 5 for 6 from the free throw line. When he was in the game, I focused on watching De'Aaron Fox. In only 17 minutes, Fox had 16 points on 6 for 7 from the field and 2 for 3 from the free throw line. I was very impressed. I think that it is going to be hard to keep him off the court. Looking at the box score after the game, I was surprised to see that LeMarcus Aldridge was the Spurs leading scorer. In only 15 minutes, he scored 17 points on 7 for 10 from the field, 1 for 2 from three and 2 for 3 from the free throw line. Sharon and Janie were also at the game. Sharon got the tickets for her company's suite. We met them at halftime. Rather than returning to our seats, Larkin and I spent the second half standing at the top of the lower bowl behind section 117. Larkin said that he didn't think that he had ever been to a preseason game before. I can find at least three times that I went to preseason game: once with Snipes (10/26/2006) and once with Jack (10/9/2007).